Sound "Play deep and powerful bass, and they can really slam"; "images are solid and stable; they are also extremely vivid"; "they have the acceleration of a Formula One racer and can startle with enormous dynamic swings"; but "microdynamics [were] somewhat limited or at least not one of the speakers strengths." Features Dome tweeter and midrange are in a separate chamber from the trio of woofers; binding posts are not recessed, making for easy connection; metal plinth makes screwing in the spikes easy. Use Solid-state amplification is recommended; a sizeable room is required because of the 6.5's powerful bass. Value "Where this speaker is strong, its Herculean and among the very best available." It was CES 2001, and without a doubt one of the best rooms I heard at the Show featured the yet-to-be-released Soliloquy 6.5 loudspeakers. Tall, slender and beautifully finished, the speakers threw a wonderfully fleshed-out presentation that was as clear as a warm spring day, and as powerful as the thunderstorms that often conclude one. I also learned at the same show that the speakers ushered in a new presence of one Phil Jones, previously best known as the brains behind Britains Acoustic Energy line and the ill-fated (upon his departure) line from Platinum Audio. A very talented designer for sure, Jones is probably best known for his penchant for deep and powerful bass as well as his ability to wring it out of the most unlikely of small boxes and small drivers. His Platinum Audio Solo was a small monitor featuring a 4" metal-cone woofer that pumped out bass in the most astonishing of ways. There was much to like about the rest of the speaker too. It had a slightly forward presentation that lent excitement to the music. It had a full-bodied and a meaty sound that did complete justice to all the music I like. I suppose that if it had a shortcoming it would be that it was power-hungry. It was a small speaker that demanded a large amplifier, and this is where the Platinum Solo is a complete antithesis to the speaker under review here. At 53" high, 15 1/2" deep, 10" wide and 130 pounds (with 1"-thick MDF cabinet walls and a 1 1/2"-thick baffle), the Soliloquy 6.5 ($6399 USD per pair) is hardly a small speaker, and with a manufacturer-rated sensitivity of 92dB and a nominal impedance of 8 ohms, neither should it be all that hungry for power. Soliloquy suggests that appropriate amplifiers will be in the 20-200W range. The 6.5 also trades a little of the bass-making mystery of the Solos for three magnetically shielded 6 1/2" rigid poly-fiber cones with diecast magnesium baskets and what Soliloquy calls "specially vented magnet systems." Notice my use of the words "a little of the bass-making mystery"; the bass response of the Soliloquy 6.5 still belies what one would expect from three such drivers and reportedly extends with authority down to a Soliloquy-specified 23Hz (-2dB). More on this later. At first glance the Soliloquy 6.5 looks to be two speaker boxes for each channel. This effect is purely cosmetic, but it does hint at the fact that the midrange and tweeter are kept separate from the bass cabinet. In that separate top chamber, Jones has installed a proprietary 2" treated-paper dome driver. Get close to this dome and you will notice that it looks wet. Soliloquy told me that the dome is doped with the same ferrofluid used to cool the voice coils. Nothing mysterious here; the ferrofluid is used to keep the paper dome from drying out. Mounted above the midrange dome is the 1" double-chamber silk-dome tweeter, which Soliloquy specifies as having 20kHz extension. Both of these drivers are said to incorporate a single-layer, edge-wound, proprietary aluminum voice coil and are magnetically shielded. According to Soliloquy, the three woofers are run with staggered high-pass filters to ease the transition from line-source bass to point-source midrange. Thus they act as a compound or composite low-frequency "triple-driver" whose cone area is then electrically, rather than mechanically, decoupled. The lower woofer rolls off at 400Hz, the middle at 800Hz, and the upper one hands over to the midrange at 1600Hz, with 6dB/octave series inductors on the two bottom woofers. The tweeter comes in at 6kHz and 12dB/octave. The drivers are attached to what Soliloquy refers to as Wave Launch plates. These are the 3/8"-thick, flush-mounted aluminum pieces. 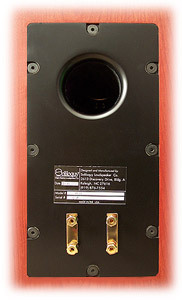 Soliloquy claims a couple of benefits for this driver mounting: mechanical decoupling from the MDF speaker cabinet, and heat-sinking for the drivers, both of which are said to reduce boxy colorations and thermal compression. On the lower rear of this impeccably finished loudspeaker are a large bass port dual along with pairs of high-quality gold-plated five-way binding posts, which are unfortunately placed too far apart for the use with dual banana plugs. 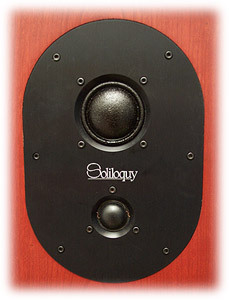 Eschewing the recessed cups so often used, Soliloquy has the posts poking right from the rear surface of the speaker in a manner that makes them completely accessible -- no matter what your combination of fat fingers and heavy-duty spade lugs. Excellent. Also receiving very high marks is the heavy metal plinth that the entire speaker rests on and that the leveling spikes thread through. It looks great, its very solid, and the spikes are long enough to pierce even the thickest of over-padded carpet, thus providing real stability for the speaker. Deserving an A for concept and a solid B- for execution is the method of grille attachment. The 6.5 comes with dual sets of screw-in bolts intended to either support the supplied grille screens or exclude them while leaving the speaker bare with a completely finished look. This is a great idea. I seldom use the grilles on my speakers, but I detest the look of the unused holes. Both sets of screws are designed to fasten into the 3/8"-thick solid-aluminum fascias (available in silver or black) that surround the drivers. Screwed in or not, the bolts do not affect the integrity of the driver mountings. The hardware that is supplied for use when eschewing the grilles works as intended and gives a nicely finished look to the speaker. But the bolts supplied to support the grilles only did so when I did not screw them all the way into the speaker. This left enough of the head of the bolt exposed for the holes in the grille frame to latch onto. Given the fact that this caused no problems for the drivers, it's an almost moot issue. But if the heads on these bolts were a little longer, it would be no issue at all. Speaking of covering the drivers, I found that I enjoyed the security, looks and sound of the 6.5s when I left the grille covers attached over the bass drivers and left the midrange and tweeter domes au natural. So thats the way I used the 6.5s. The standard 6.5 is available in three real-wood veneers (curly maple, rosewood, and the English cherry of my review pair) and silver or black Wave Launch plates. At CES 2002, Soliloquy introduced ten optional high-gloss automotive lacquers from the Audi, Mercedes, Jaguar and Ferrari palettes. Final pricing for these custom finishes is yet to be announced. I used the soliloquy 6.5s in both of my listening rooms, but they did sound their best with the added breathing room of the larger of the two. The high-frequency balance is one factor that varies in accordance with the amount of toe-in applied to the speaker: too little toe-in and the speakers highs can sound a little rolled-off; too much can make the treble hard, brittle and piercing. But with a little perseverance, an excellent balance can be struck between detail and musicality. Any speaker with as extended a bass response as the 6.5s is going to require careful placement in order to achieve a flat response, and one with neither too much boom nor bloom. I dont mean to imply that these speakers are especially difficult to place, but they will pay back a little work with real reward. I also found the Soliloquy 6.5s somewhat demanding of upstream electronics. They are of high enough resolution to bring to the surface ripples and irregularities found in the rest of our system. I judge the 6.5s to be at their best when mated to high-quality solid-state gear. I tried a variety of tube amps that I thought I knew pretty well and with which I would have expected better results. But I never found one that I thought mated as synergistically as my Herron M150 monoblocks. While an Adcom GFA-7000 ultimately lacked the detail and refinement commensurate with such a pair of speakers, I found it to be generally good-sounding with the 6.5s. This isnt to say that prospective buyers should shun tubes altogether, but I would urge careful audition with your amp of choice. No matter the electronics, the Soliloquy 6.5 produced one of the fullest bass responses Ive ever heard from a speaker anywhere near its price, and even somewhat beyond. Make no mistake about it -- the Soliloquy 6.5s are not speakers requiring the augmentation of a subwoofer. To the contrary, the 6.5s can give lessons in bass reproduction to a lot of so-called subwoofers out there and are the low-end equal of any speaker in their price class that Ive had here, including the NHT 3.3, a speaker widely known for its bass prowess. The 6.5s play deep and powerful bass, and they can really slam. I also have to admit that I spent some time with the 6.5s in my home-theater system, and their bass performance was nothing short of amazing. Without the aid of a subwoofer, movies were presented with absolutely nothing to be desired. Bomb blasts, depth charges, tank thunder -- you name it -- the 6.5s did a marvelous job at reproducing all the power and authority that the various soundtracks demanded, and all with a modest 125Wpc Adcom amplifier. I doubt that Phil Jones, a bassist, intended the 6.5s for the reproduction of such pyrotechnics. I would guess that hammering bass drums and surging electric basses are closer to his heart, and the 6.5s did complete justice to those as well. Loudspeakers  Silverline Sonata II, Magnepan 1.6/QR. Power amplifier  Herron Audio M150, JoLida JD 3000A and Naked Truth Audio Calla monoblocks; Conrad Johnson MV60 stereo amp; Adcom GFA-7000 multichannel amp. Digital  Music Hall CD32 CD player, Pioneer DV-525 DVD player/Bel Canto DAC 1.1 combination. Analog  Sota Jewel turntable, Premier FT3 tonearm, Benz-Micro MC Silver cartridge. Accessories  Vibropod isolation footers. Imaging and soundstaging are both highly evolved. Images are solid and stable; they are also extremely vivid. The presentation is so fleshed out and meaty as to almost boarder on the visual. While some speakers do a better job of transporting you to the recorded venue, the 6.5s are better at bringing the performers into the listening room for an up-close-and-personal command performance. While not in your face, the 6.5s are not exactly relaxed or passive either. They have a very immediate quality about them that many will find invigorating and involving, while others may prefer something a little more ethereal and relaxed. Either way, one thing that the 6.5s always do is throw a wide and deep soundstage. Images regularly appeared from beyond the speakers physical boundaries, and with excellent clarity and focus. Layering of images was also very well done. Macrodynamics are another of the Soliloquy 6.5s strengths. They have the acceleration of a Formula One racer and can startle with enormous dynamic swings. One day I was puttering around the house and playing Eric Kunzels Classics Of The Silver Screen [Telarc CD-80221] -- admittedly not one of my more frequently played discs. The 6.5s and "Who Framed Roger Rabbit" (Liszts "Friska" from Hungarian Rhapsody No. 2) teamed up to provide me with a heart-stopping experience as the track seemingly jumped from neutral to high-gear in a split second. In fear for the lives of the speakers, I turned quickly and lunged for the volume control, only to observe that the 6.5s were taking everything in stride and showed no signs of distress whatsoever. Dynamic agility is one thing, but these speakers can also run at a full-on gallop and seemingly never break a sweat. Where microdynamics are concerned, once again the speakers were at the mercy of the amplifiers I had available. With several of the amplifiers on hand, I found microdynamics somewhat limited or at least not to be one of the speakers strengths. While classical music was not what I would call dynamically bland, it could, with the wrong choice of amplification, sound a little blurred dynamically speaking (do not confuse this with a loss of musical detail and focus). The Herron M150 amplifiers are microdynamic champions, and they went a long way to bolstering the 6.5's performance in this regard. But this was one area where I never felt the 6.5s to really excel in comparison to the very best out there. Prokofievs "Tybalts Death" from Sony Classicals Rostropovich--Return to Russia. [SK 45836] features frenzied yet stirring strings, deep and powerful basses and powerful brass with authentic blat. But the piece did not have quite as much excitement as Ive heard elsewhere, as the 6.5s blurred transient attack a little bit, which robbed the piece of some of its furor. But with the 6.5s in use, Stevie Ray Vaughans posthumously released rendition of "Little Wing" from The Sky is Crying [Epic EK 47390] sounded better than Ive ever heard it. Users of dual subwoofers know that theres more to stereo bass than subterranean boom. Otherwise unleashed spatial cues are found in those low frequencies, and while this track can sound rather dry over a lot of speakers, the Soliloquy 6.5s really opened it up and created a real sense of enveloping space that I never knew the track was capable of. Upon this discovery, I must have played the track ten times. The expanded soundstage wasnt the only reason to play the passage over and over, however. The pounding bass drums also had newfound heft as well as detail, and Tommy Shannons bluesy bass lines just never, ever sounded better. Of course, as good as his band was, Vaughan still stole the show with blazing guitar work, and even the guitar-amp hum lent an air of authenticity to the whole performance. The 6.5s did a scrupulous job of resolving SRV's jazzy nuances on "Chitlins Con Carne," and while, on occasion, I could be critical of the speakers treble performance, Chris Laytons cymbal work was reproduced as near to flawlessly as I can remember. Without question, The Sky is Crying allowed the 6.5s to really show off their strengths, and any minor shortcomings of the speakers were rendered completely inconsequential. They exuded drive, power, authority and rhythm. The same could be said of all the rock as well as jazz recordings I fed these speakers. They all sounded terrific. If the 6.5s are going to run into trouble in your home or with your electronics, they are probably going to show symptoms in the upper midrange and treble. Dont get me wrong -- when things are right, the sound is awfully good. But when things are wrong, the sound can be awfully bad. Poor positioning and mismatched electronics can result in hard and spitty treble that is completely out of character with the rest of the speaker. If the Soliloquy 6.5s have an Achilles heel, it is that the treble falls a little behind the excellent midrange in the areas of air and delicacy. Once again, the 6.5s can also have problems with too little toe-in, as they can be made to sound dull, lifeless and devoid of inner detail. Oddly enough, in my smaller room, I found that much less could go wrong than in my larger room. It seems that the more the speaker has the opportunity to interact with the room, the more care you have to take. The similarly priced Silverline Sonata IIs proved a study in likeness and contrast as compared to the Soliloquy 6.5s. The speakers shared a similarly clean and revealing midrange, and down to around perhaps 35Hz, the Sonata IIs hung with the 6.5s in the area of bass power and detail. Ultimately, though, they couldnt dig as deep as the 6.5s, which overpowered them with bass that was solid below 30Hz. The Soliloquy 6.5s proved a dB or two less efficient, and the speakers had remarkably similar tonal balance. It was in the upper octave where the Sonata IIs came on strong, with a more highly refined, if slightly more forgiving, treble that also translated to a little added transparency. Another thing that really set the speakers apart was their imaging characteristics. The 6.5s' vividly portrayed images stood in contrast to the more airy presentation of the Sonata IIs. People will undoubtedly differ in which presentation suits their fancy. Soundstaging capabilities were outstanding with both speakers. The Soliloquy 6.5 speakers impose two requirements if they are to sound their best: careful choice of electronics and room placement. Where this speaker is strong, its Herculean and among the very best available. Bass response is outstanding -- it just doesnt get much better. The midrange is clean, uncolored and transparent. Large-scale dynamics are all in a days work for these speakers, soundstaging is excellent, and images are sharply delineated. My personal recommendation would be to look toward the highest-quality solid-state electronics you can find and give the speakers some breathing room. Then sit back and let them do what Phil Jones designed them to do: play music. Price: $6399 USD per pair. Our thanks to SoundStage! and John Potis for a well-written and comprehensive review of our flagship effort. When publisher Doug Schneider sent us the measurements for confirmation, he noted that the distortion figures above 200Hz were the lowest of any speaker SoundStage! had yet tested via the famous Canadian National Research Council. One of the reasons for this excellent performance is the unique way in which we fasten our proprietary, Phil Jones-designed drivers to the 6.5. We secure the drivers to the front baffle utilizing a proprietary technology called Wave Launch. Wave Launch uses specially engineered and machined aluminum plates to which the drivers are mounted. This decoupling technology eliminates mechanical transducer energy from interacting with the cabinet, something that's very common, especially in larger speakers. The end result is a speaker system that offers significantly lower distortion and freedom from cabinet colorations and blurring. The 6.5's unusually extended bass response and control can surprise even experienced listeners. Other benefits of Wave Launch, as John Potis noticed, are superior soundstaging that allows images to float freely without "sticking" to the speakers. We're pleased to see that John took care to position the 6.5s for best interaction with his room. Any speaker that attempts true full-range performance will always be more critical in that respect. As a rule of thumb, we recommend rooms of 300 square feet (or 14" x 20") as the realistic minimum to enjoy the 6.5's formidable bass output and extension unencumbered by space limitations. We concur with John's general recommendation for solid-state amplification with this model. However, a well-matched tube amp will yield surprisingly potent results. SoundStage! 's own CES 2002 coverage team noted that "Art Audio's Gill Signature (15Wpc) SET amplifier ... sounded surprisingly dynamic driving Soliloquy 6.5 speakers." We used Art Audio's larger 20-watt Jota during Home Entertainment 2001 in NYC and had certain magazines rank this room among the show's best. CES 2001 coupled the 6.5 with Cary Audio's V-12 tube amplifier in triode mode to produce what John called "without a doubt one of the best rooms I heard" in his intro. Lastly, we believe that a good loudspeaker should perform optimally with all kinds of different amplifier topologies. We design all our products with benign impedance curves, narrow phase angles and better-than-average sensitivity specs to that end. We would like to point to the Marsh Sound Design line of amplifiers as very complimentary components to our speaker products. This was a catalyst in our becoming the exclusive North American sales and marketing arm for Marsh Sound Design late last year. However, Soliloquy will continue to focus on delivering speakers that work equally well with both tube and solid-state amplifiers.